Greater Burlington is still waiting on a memo from Mayor Weinberger’s administration about how the Queen City plans to handle smartphone-based car services that have been eyeing the area. Uber — the best known among them — is not. It’s sending representatives to the Holiday Inn in South Burlington on Wednesday and Thursday to sign up local drivers and hand out phones. Wildly popular among consumers, resented by cabbies and perplexing to regulators, Uber now operates in more than 170 cities worldwide and is valued at roughly $15 billion. The company connects passengers with drivers through an app, offering them a convenient alternative to hailing a traditional taxi. It's clashed with regulators in numerous cities, who've taken the company to court for not obtaining taxi licenses and failing to adhere to other regulations that apply to livery operations. 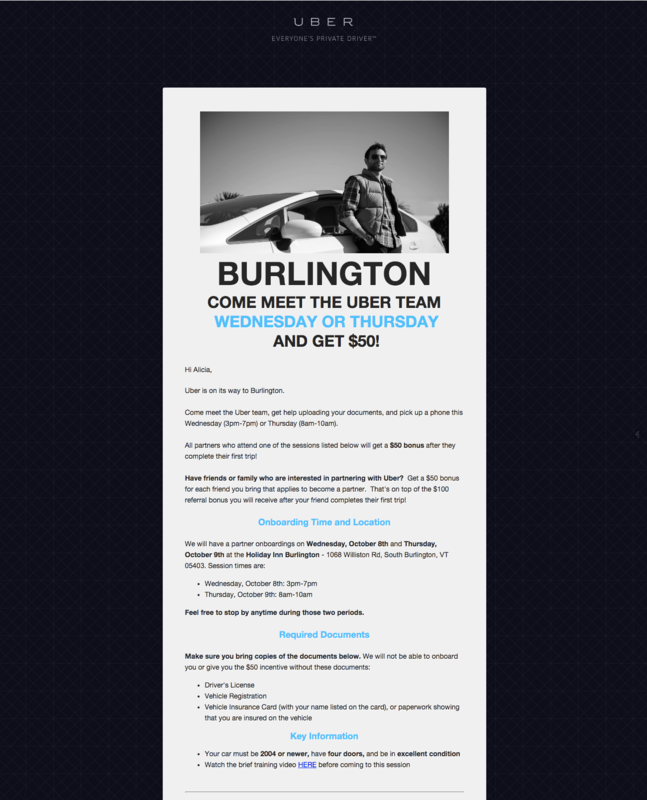 Several months ago, Uber began recruiting Greater Burlington drivers by posting ads on Facebook. On Sunday, the company sent out an email and text blast inviting those who have signed up to "meet the Uber team" and pick up phones at the Holiday Inn. Drivers who attend one of the sessions are promised a $50 bonus after their first fare, as well as additional $50 bonuses for each driver they recruit. In August, Uber spokeswoman Kaitlin Durkosh said the company was simply doing market research in the Burlington area. Reached by email Monday morning, Durkosh maintained that is still the case. "We have driver partner sign-up events in every city we're exploring as a way to gauge interest from local drivers who'd like to partner with us," she wrote. Uber is making moves in Burlington at an interesting time. The city is poised to restructure the way it oversees the taxi industry — for years, drivers and passengers alike have complained that it has not enforced taxi regulations. In part, that's because the regulators have been based at the Burlington International Airport. Meanwhile, the downtown has become a "wild west," according to airport commissioner Jeff Munger. At the request of his commissioner colleagues, who claim the oversight responsibility has become a burden, the city attorney's office recommended overhauling the system and beefing up enforcement. No changes have yet been implemented. Weinberger's chief of staff, Mike Kanarick, was surprised to hear of Uber's upcoming events. "This is the first that either the mayor's office or the city attorney’s office has heard of Uber's plans to come visit Burlington on Wednesday, as you indicated to us. We in the mayor's office do plan to reach out to Uber to learn more about their plans," Kanarick said on Monday. The city attorney is still working on the memo, according to Kanarick. Taxi company owners are anxious to see whether Burlington will embrace or crack down on digital car services. In an interview last month, Green Cab owner Charlie Herrick said, "I’ve had discussions with the other owners and everybody feels as far as I can tell that we welcome competition as long as they play by the same rules." In Herrick's opinion, Uber hasn't. "There’s gonna be a difference in opinion if they want to operate under the current model."